I’m sure that everyone reading this has heard of the Boston Marathon as it’s probably the most famous marathon in the world, if not the oldest standing race. What most people don’t realize is how difficult it is to make it to the starting line. You can’t just sign up for Boston; you need to demonstrate you’re worthy by qualifying. Qualifying means that in the year prior to the race, you need to absolutely kill it in a marathon recognized by the Boston Athletic Association. Qualifying standards are set based on gender and age. For example, being in the 50-54 age group, I would need to finish a qualifying race in 3:30 or less. Even hitting 3:30 or less does not guarantee entry; it only provides the opportunity to submit for registration as they only allow a certain number of athletes per age group. Depending on the number of applicants, most people will need to finish several minutes lower than the standard for their age group. I would need to finish under 3:30 – probably closer to 3:25. Yikes. Running a 3:25 marathon means holding a 4:50/km. pace for 42.2 km. Honestly, I can’t get my head around that. That’s crazy fast. I’ve carried that pace during a tempo run but it was only 5 to 7km. And that was on a flat track with what I’m sure was circular tail wind that pushing me the whole way. I can’t imagine holding that pace for 35 more kilometers. Those that qualify are a special breed that have my utmost respect. Just staying injury-free while putting in so many training miles on the road is a huge accomplishment. 2016 was a big year for Boston qualifiers in our club. Eight club members / friends ( Shauna D, Jackie D, Tim L, Marinus W, Elizabeth A, Debbie S, Trudy H and Ann H) competed this past April and another, J-M A, qualified for the upcoming race. “Unicorn Tears” seems like an appropriate name for a drink to pay tribute to our qualifiers. It sounds better than “Unicorn Blood, Sweat and Tears” which is probably a more accurate tale of their journeys. Yeah, I know – the drink should be green because green is a Boston colour (a tribute to its very Irish roots), but we had green yesterday and there’s only so many green cocktails that can be tolerated in one week. And this looks more festive. Tonight, we’re keeping it super classy (like our qualifiers) and breaking out the fine glasses and bubbles. Unicorn Tears is comprised of an ounce of gin, and half ounces each of Chambord, St. Germain and Peach Schnapps. 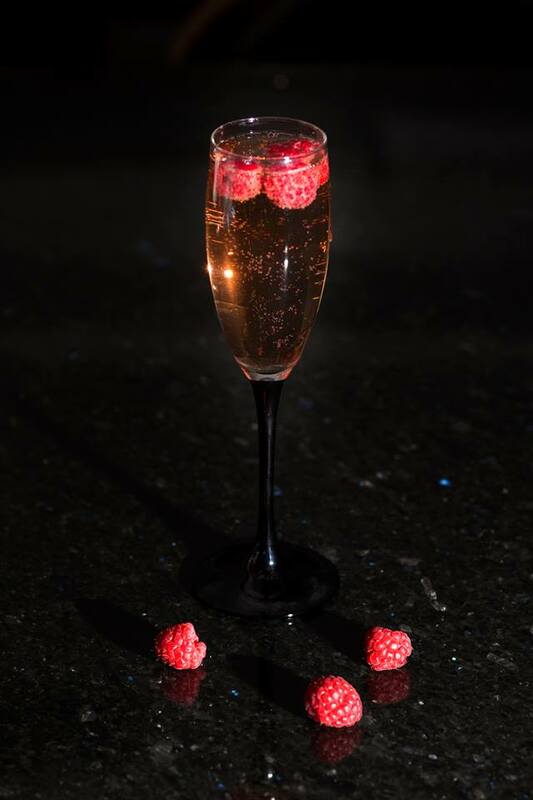 It is then topped with Prosecco and fresh raspberries. Cheers to you Marinus, Jackie, Tim, Shauna, Elizabeth, Trudy, Ann and Debbie! And a huge cheers and good luck to you J-M! Well done gang! Copyright © 2019 The 12 Days of Drinking.